Product prices and availability are accurate as of 2019-04-22 20:14:44 UTC and are subject to change. Any price and availability information displayed on http://www.amazon.co.uk/ at the time of purchase will apply to the purchase of this product. 1.This RC model is not a toy and is not suitable for children under 14 years old, keep it away from children. 3.Headless mode: Completely solving "loss of orientation" problems. 4.One key to return: It can find its way home easily, reducing your fear of losing it. 5.Equipped with LED light, the drone will shine in the darkness which is good to show you the right flying direction. With transformable egg appearance, novel and unique, H/L speed mode for you to experience cool flying play,2.4G 4CH transmitter and 6-Axis gyro for your easy and stable control. One button take off / landing function: avoid lost aircraft and bring drone back with the simple push of a button. 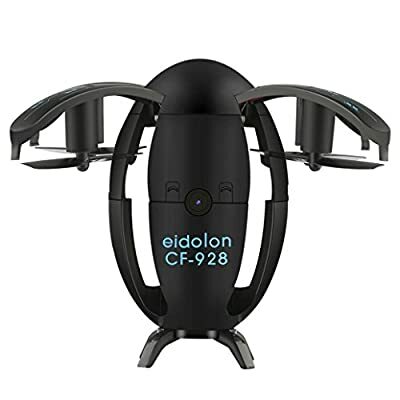 Altitude hold mode makes it easier to control the drone for beginner and more stable for aerial photography,2 megapixels camera can capture and record every beautiful and unforgettable moment. Gravity sensor mode allows you to fly the drone forward/backward/left/right in correspondence to the angle of the mobile phone. Wifi control to realize real-time transmission for live video by pairing the mobile app to the drone wifi. Mobile phones with IOS or Android system are available.